One of the books that I loved but never wrote about here was Wonder. I made the mistake of reading it on an airplane and then was awkwardly trying not sob my face off and alarm the stranger sitting next to me. I’m sure you’re familiar with Wonder, since it’s been wildly popular for the last several years, and of course, once a book becomes super popular, it’s used to sell all sorts of other only slightly similar books. So when Mustaches for Maddie was compared to Wonder, I was dubious that it would actually be all that good. But then I was nursing the baby and Mustaches for Maddie was the only non-board book within reach and I read it in a day. It was such a charming and touching book. The story follows Maddie who is twelve and loves making her friends laugh. One of her funny little tricks is carrying around fake mustaches of all sizes and colors and slapping them on at surprising moments. Of course, like many twelve-year-olds, her friendships are tricky, especially because of one girl in her class, Cassie, who likes to exert her power by deciding who can and can’t hang out with her during recess and lunch. Maddie can usually get on Cassie’s good side, but when Maddie is cast as Juliet in the school play (the role that Cassie wanted for herself, of course), things quickly get tricky. And Cassie is one of the first to notice that Maddie is holding her arm in a weird way, which she is quick to point out to the other students. As her hand gets worse, Maddie’s mom takes her to the doctor where they discover that Maddie has a brain tumor. Now, it’s not just Cassie’s bullying or her role in the play or her new friend that Cassie doesn’t like that Maddie has to worry about. Does she tell her friends about her brain tumor? And is the surgery going to go okay? This story is based on a true story – the authors of this book are husband and wife and their daughter was diagnosed with a brain tumor when she was nine (and one of the reasons I was inclined to pick up this book in the first place is that my youngest brother was diagnosed with a brain tumor when he was two years old). One of the things I loved about this book was the mix of humor with the strong emotions that go along with a cancer diagnosis – fear and anger and worry about how others will react and how to share the news. And I always appreciate a realistic depiction of a family where everyone is trying to be good people but also sometimes argue, say dumb things, make each other mad and then try to make things right and move on. 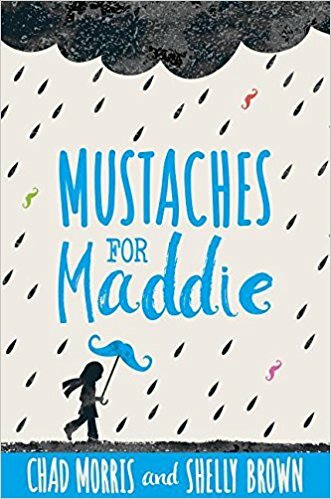 If you’re looking for a solid middle-grade novel, I highly recommend Mustaches for Maddie. It’s fantastic, funny, and well-written. And if you haven’t read Wonder, you should read that one too. This sounds like a great read! Adding to my TBR!